Looking for a custom color cladding solution for your next project? Nichiha’s Illumination might be exactly what you’re looking for! Sleek, bold, vibrant. 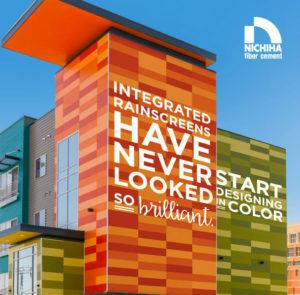 These are the words industry professionals are using to describe Nichiha’s Illumination line of fiber cement panels. Kinzler Construction Services is now distributing Nichiha’s Illumination Series, delivering sleek sophistication with a custom flair. Its smooth satin finish, easy installation and a virtually limitless color pallet give you a degree of design freedom that most cladding products simply can’t match. Delivering sleek sophistication comes naturally for Illumination, but don’t let the handsome face fool you…there’s more than meets the eye. Integrated rainscreen for moisture management. Drained and back ventilated rainscreen design allows water to escape and air to circulate, reducing risk of mold and water damage inside the building. Award-winning, simple clip installation system. Features hidden fasteners for uninterrupted appearance. Time-saving clip installation system reduces construction time and minimizes mistakes. Fiber cement construction that is resistant to warping, rotting, and falling victim to pests. Any weather product – Products can be installed year-round in any climate across the country. No geographical restrictions means more possibilities. Backed a 50-year limited warranty – some of the strongest warranties in the business. When compared to traditional aluminum composite and phenolic panels, Illumination is a budget-friendly option! Visit our vendor, Nichiha, for more information about Illumination. Kinzler Construction Services distributes a full line of construction materials, including drywall, steel framing, acoustical ceiling tile & EIFS. With locations across America’s heartland, Kinzler is a rapidly-growing, family-owned company offering industry-leading service to the best customers. Contact us today at 888-292-2382 to see how we can partner on your next project!